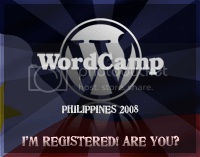 I attended my first Wordcamp in Melbourne, and I’m looking forward to attending my second one right here in Manila, Philippines! That’s sounds pretty cool. I’d love to get to know wordpress more. I’m a new convert. wow, now that’s a good event to join! WOW! You already attended a WordCamp before? I hope we don’t disappoint you. Nomadic Matt: Yay for WordPress! How are you finding WP so far? Estan: Yup! Hope to see you there, Estan! Hi. I am new here. Started my blog 4 years ago but abandoned it too soon. Now I am back. By the way,do we get wordpress connections like facebook, tumblr and multiply? Wondering….